Triangle Collision is a state-of-the-art auto body shop delivering factory-approved repairs to the Cary, NC area. Our factory-trained technicians are equipped with the tools and equipment to return your vehicle to pre-accident condition. That means when your vehicle goes back out on the road, you can rest assured it’ll be just as safe as when it rolled out on the showroom floor. We’ll also keep you moving with 24/7 towing and can arrange for a ride home or a car rental if you need it. We want our customers to know that they have a reliable auto body shop to turn to. For that reason, we offer Lifetime Warranties for our auto body repair and paint services. You’ve made a significant investment into your vehicle. 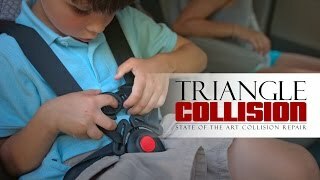 Protect that investment with Triangle Collision. Triangle Collision is the trusted Cary, NC auto body shop. We strive for what we call an “invisible” repair. To achieve this, we use factory-approved parts as well as follow strict factory guidelines on all repairs. With modern vehicles, repairs are even more difficult. Each modern vehicle requires more in-depth education than the last. High tech sensors and meticulously designed structural components need to be repaired to match how they would function out of the factory. Here at Triangle, we have the training and experience to get the job done right, the first time. Use factory-approved repair techniques and tools. Be honest and open with our customers. Provide lifetime warranties on body work and paint. It’s your choice, not the insurance companies, where your vehicle is repaired. Choose Triangle Collision, the premiere Cary, NC collision center and auto body shop. Why use an auto body shop with factory-trained technicians? Modern vehicles are more complex than ever. And in order to protect the value of your car, it must be repaired using the proper techniques and parts. Our technicians know the manufacturer’s processes and use them when taking your vehicle apart and performing repairs. We also use original equipment manufacturer (OEM) parts, which are guaranteed to fit flawlessly into your vehicle. This is how we can perform an “invisible” repair on your vehicle. Upon post inspection, there will be no signs that your vehicle was in a collision. This means your vehicle is performing exactly how the manufacturer intended. This fact also helps to maintain the value of your investment. Your Vehicle Will Look Great Too! Performance and safety are important—but you want your vehicle to look good as well. Our high-tech painting and refinishing services will get your vehicle looking showroom new. We use BASF technologies, the global leader in paint and refinishing equipment. BASF systems are factory-certified in their ability to color-match vehicle paint to the original color. We bring our same dedication in quality auto body repairs to our refinishing services. This means your automotive paint repair is backed up with our lifetime warranties. We are partnered with Lemon’s Wrecker Service, a family owned and operated towing company. Lemon’s is available 24/7 and they bill us directly for the job. This way your insurance covers the cost, and you will not have to worry about being stranded. Insurance claims are stressful and confusing. Let us help you navigate through this stressful time. Here at Triangle Collision we work with all major insurance providers to make sure your vehicle receives a full repair. Where you take your vehicle after a collision is your choice, not your insurance companies. With Triangle Collision you know you have a trustworthy auto body shop to turn to. Automakers invest millions of dollars into making their vehicles safer. These vehicles are designed to react in a very specific way when in a collision to keep you safe. Our repairs preserve the integrity of these safety systems. Our collision repairs follow strict factory guidelines to make sure your vehicle is repaired exactly how the factory intended it. There is no one-size-fits-all repair for modern vehicles. We approach each new repair as a unique case. And we perform a full inspection to find the extent of the collision damage. Even minor looking damages can impact the accuracy of modern safety systems. In a collision it is vital your air bags, seat belts, sensors, and other features are performing exactly as the manufacturer designed them.